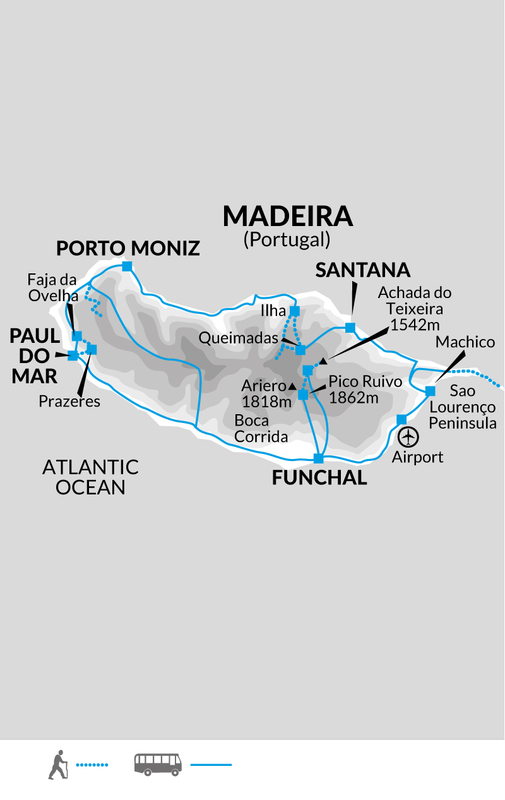 Madeira is a magical island, and the best way to see it is by foot! Our one-week trip aims to offer travelers the opportunity to get to know the lie of the land, without joining a bus-based package tour. We use a local operator, family-run hotels and local restaurants that serve fine traditional cuisine (try the fantastic Madeira Wine and Madeira Cake! ), which means that the money our groups bring remains within these small communities. Here, the rural island culture continues much as it has for centuries, and we spend as much time as possible out and about walking and learning more about this island's natural environment. absolutely wonderful - better than excellent. BRING A FULL SET OF WATERPROOFS!!! We went in February and did not pack over-trousers and regretted it. It is cold in the mountains and any cloud coming over the Island has to climb 1800m, so will deposit a full load of rain on you. We walked on one day in heavy rain from start to finish and were soaked through. Our assumption that we would be warm as we were on a subtropical island was wrong. Come prepared for bad weather and then you will be able to enjoy it more if the weather is good!